The Marshall 5" On-Camera Monitor is a high performance color monitor that mounts to the top of a camcorder or video DSLR using the provided shoe mount adapter. The monitor delivers superior brightness and sharpness, supports a wide range of formats and markers, and offers versatile viewing angles. 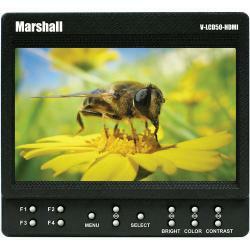 Major monitor controls such as brightness, contrast, and color are easily accessed from the monitor's front panel. There are also four preset keys so that the videographer can, at the touch of a button, instantly access often used functions. To help the videographer maintain optimum image quality through various lighting and scene scenarios, this monitor offers a number of test tools including False Color Filter and Peaking Filter functions. False Color Filter is used to maintain a natural look for people and objects when there's a change in a camera's brightness and luminance levels. Peaking Filter employs a color to black and white changeover method to help ascertain what areas of the image are lacking in focus or sharpness. With these tools at hand the videographer can shoot with greater confidence, knowing that what is shown on the screen is an accurate representation of what is being recorded or broadcasted. 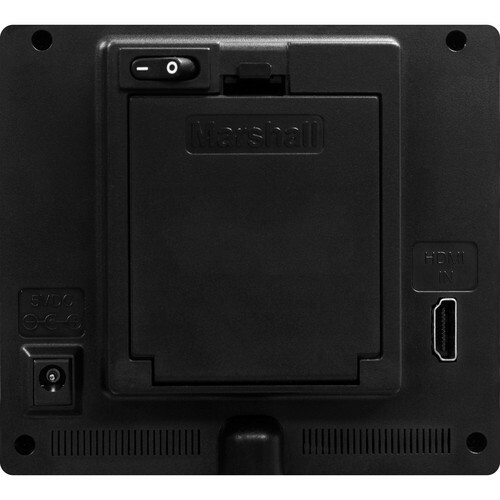 This monitor operates off of the included power adapter or via battery power (4 AA) for field operation. With this level of performance and versatility, this monitor offers the perfect alternative to the often inadequate viewfinder and flip-out screens found on many of today's cameras. False Colors The False Color Filter is used to aid in the setting of camera exposure. As the camera Iris is adjusted, elements of the image will change color based on the luminance or brightness values. This enables proper exposure to be achieved without the use of costly, complicated external test equipment. To best utilize this feature, you must understand the color chart and have a basic understanding of camera exposure. Normally, when shooting subjects like people, it is common practice to set exposure of faces to the equivalent of approximately 56 IRE. The False Color Filter will show this area as the color PINK on the monitor. Therefore, as you increase exposure (open the IRIS), your subject will change color as indicated on the chart: PINK, then GREY, then a few shades of YELLOW. Overexposed subjects (above 101 IRE) on the monitor will be shown as RED. In addition, underexposed subjects will show as DEEP-BLUE to DARK-BLUE, with clipped-blacks indicated with a FUCHSIA-like color. Lastly, the color GREEN is used to indicate elements of the image that are approximately 45 IRE. This represents a "neutral" or "mid-level" exposure commonly used for objects (not people). Peaking Filter The Peaking Filter is used to aid the camera operator in obtaining the sharpest possible picture. When activated, all color will be removed from the display and a black-and-white image will remain. The internal processor will display RED color on the screen where sharp edges appear. When the camera operator adjusts (or "racks") the focus control (on the camera lens), different parts of the image will have RED colored edges. This indicates that this portion of the image is sharp or in focus. Final focus is achieved by racking the camera lens focus control back and forth until the desired portion of the image has RED colored edges. Viewing Angle L+R: 170? / U+D: 170?